While we welcome good food, a cozy fire, and time with extended family as much as anyone, we also think a break in the kids’ school schedule allows for a little outdoor adventure. So we added Grand Canyon backpacking to our road trip of visiting friends and family. We started down the 9.5 mile Bright Angel trail in a snowstorm, camped at the Colorado river, and then were lucky to have a bright and beautiful second day for the 7.5 mile South Kaibab Trail. The kids were amazing backpackers, interested in the layers of rock and the ever-changing terrain, and able to hike for several hours between packs-off rest stops. I was proud of their accomplishment and impressed by their fitness. 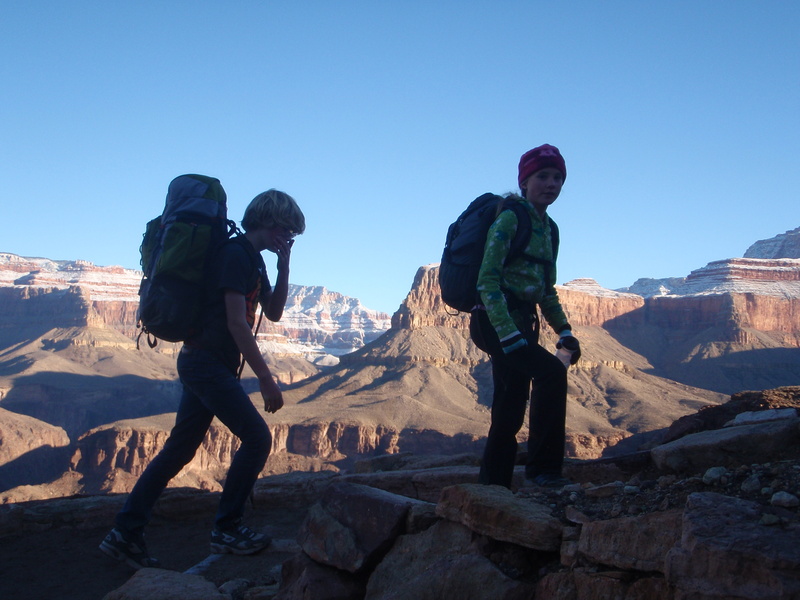 We trekked the most utilized trails in the Grand Canyon, but doing so in winter made the experience feel more remote than it was. Three days there wasn’t enough, and I think all of us would welcome more Grand Canyon adventures. Hi Laural, excellent blog you’ve got going here. I’m planning a round the world trip with my fiance and our toddler, and we hope to have saved up enough cash to set off in around 18 months time. Our little one will be nearly 3 then, and we’re hoping to spend time taking a road trip around the USA. We’ve so many ideas at the minute its great to be able to read about other people backpacking experiences!